Identifying yourself with a particular group is... risky. Don't get me wrong, we have to belong somewhere. We have to collaborate with others for food, shelter, and knowledge. We have to share similar values and beliefs with others for stability. From smaller communities-- a family unit or city-- to larger groups of political opinions or citizens of a country, groups are essential for cultivating peace, prosperity, and support. However, like every other good thing, the blessing of community has been tainted by sin and it can all too easily become something we hold in far higher esteem than we should, blindly following it above God. "Conservative." "Charismatic." "Liberal." "Baptist." "Environmentalist." "Calvinist." "Social Justice Warrior." "Egalitarian." When you hear these titles what comes to mind? No doubt, certain beliefs popped into your head, along with a mental picture of the kind of person who believes them. Chances are, you strongly identify with one or more of these groups and discard the rest as wrong-- especially as some of those groups clash heads in many ways. This is where we might run into the danger of group identity. Identify: to associate (someone) closely with; regard (someone) as having strong links with. What I've noticed-- both in myself and others-- is a tendency to look at a group, agree with the general beliefs of that group (identify) and then assume the more inconspicuous beliefs of that group are also true without really examining them or examining opposing viewpoints. In a way, we accept the whole identity of that group as our own. It becomes who we are. If the majority of our group has this view, we have this view. If the majority of our group dismisses that view, we dismiss that view. As Christians whose whole identity is supposed to be rooted in Christ, accepting any group's beliefs without looking at them through the lens of scripture should raise a big red flag. The problem is, this kind of thing sneaks up on us, and we often do it without even realizing, especially when we've grown up taking many of these beliefs for granted. Does this mean that we should never side or group with anything other than expressly Christian circles? If we are trying to escape embracing ‘group-think’, we cannot even expect Christian circles to save us from this trap. In fact, it can be worse in some ways. When we are comfortable in any group, Christian or not, we are just as likely to follow blindly, nodding our heads to everything our leaders say-- our leaders who, like us, are fallible people. I'm not saying you should toss out what you're taught or reject instruction or godly uses of authority until you "prove" them, not at all. When done properly, examining beliefs isn't a sign of rebellion, it's a sign of maturity. This is not about proving others wrong or even being right. It's not about finding other's weak points. It's about our faith truly being our faith-- not our peer group's or our parents' or our teachers'. It's about having our identity rooted in Christ. From how we treat the outcasts, widows, and orphans, to how we treat the environment. From the role we play in our family and church, to our view on justice and mercy, everything. All the groups and ideas that we identify with-- God has something to say about them. 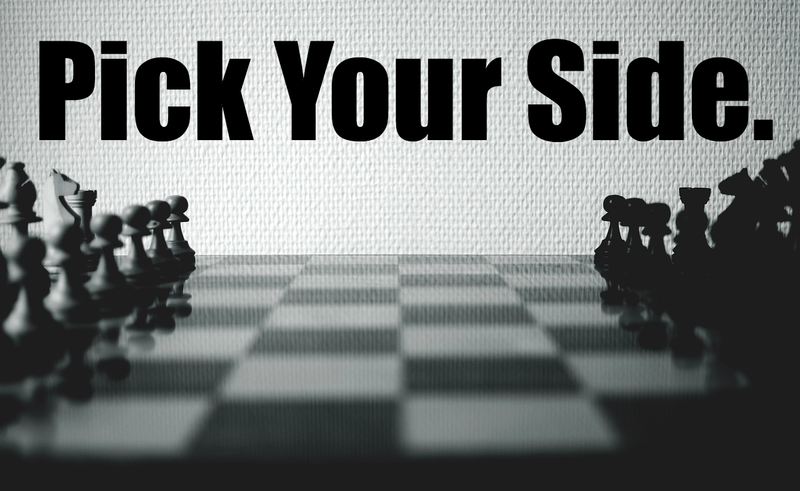 We need to constantly ask ourselves: who’s side are we on? Where do truly we place our identity? Is it in Christ and his word? Or is it in Christians and their word or political groups and their word? I beg of you, please understand what you believe. Please examine everything through the lens of scripture, not just what your friends, or your teachers, or your parents, or even your pastor teach. Remember that God is the ultimate authority, not man. And even though you should respect and take into consideration what those authorities say, they do not know everything. Even when they are right, we still shouldn't take examining the scriptures lightly. (Like I said, it's not about being right) If we coast along in life and leave the learning and studying to leaders, we will lose our roots. We will forget why we believe and do all the good things we do in the first place. And even if we don't turn from our faith or key parts of it, we and future generations will suffer; good, solid teachings will slide and unbiblical ones will have a far easier time wiggling in.